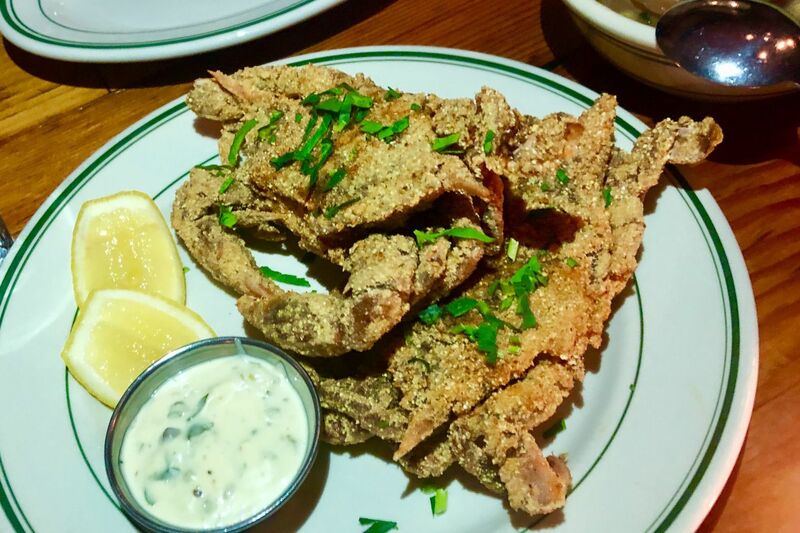 The spring's first soft-shell crabs were spotted - and devoured - at Hungry Pigeon at the end of March. These corn-crusted crustaceans came from the Carolinas. Every year, as temperatures rise, crabs begin molting — shedding their hard outer shell. So begins soft-shell crab season. This year, the sweet, meaty, slightly crunchy crop has arrived a little earlier than expected, exciting chefs and customers. Noord is one of more than a dozen restaurants featuring soft-shell-centric dishes among their specials, whether deep-fried in buttermilk batter, sandwiched inside a croissant, or grilled. No matter the preparation, no picking or cracking will be required: All parts of a cooked soft-shell crab — from legs to claw — are edible and delicious. Use a fork and knife, or better yet, your hands, to dig in. Take note: Call ahead to check that a restaurant has soft-shells on the menu, as there are occasional gaps in availability throughout the season (spring through early fall). Prices for these specials vary with the market. Noord is going full-on spring, serving two buttermilk-battered, deep-fried crabs over a bed of peppery watercress, fresh gooseberries, and a gooseberry mostarda. Nestled in between, find smoky mashed potatoes laced with baccalà. Once summer returns, keep an eye out for Noord’s go-to for soft-shells: watermelon-feta-mint salad. You can have it all with Fond’s soft-shell brunch special, a lightly battered fried crab tucked into a Machine Shop Boulangerie croissant, along with sliced avocado and tomato, crispy bacon, and a smear of Caesar dressing. For dinner, the Passyunk Square restaurant serves crabs two to a plate, sautéed in butter and lemon, paired with a rotating side, like asparagus risotto or fregola with tomato-fennel broth. Hungry Pigeon in Queen Village crisps up buttermilk-and-cornmeal-coated soft-shells in the deep-fryer and finishes them with house-made Old Bay seasoning and a dollop of tartar sauce. Each order comes with a stew of Green Meadow Farm crowder peas braised with broad beans, bacon, and tomatoes. Later in the season, swap soft-shells for the meat in the cafe’s egg-and-cheese sandwich. A few seasonal ingredients join forces at Serpico for its soft-shell special, starring a deep-fried crab dredged in rice flour and paired with fresh peas, shaved rhubarb, and a spring onion-strewn crab gravy. Finishing off the South Street special is gribiche — a French sauce made with eggs, herbs, and capers. Bud & Marilyn’s in Washington Square West puts its soft-shells in the skillet with garlic butter and lemon. Each plate comes with two jumbo crabs, roasted sunchokes, blistered tomatoes, and mixed greens. Center City’s jazz cafe serves up soft-shells three ways for lunch or dinner: grilled, served over sautéed ramps with a Meyer lemon drizzle; as a hoagie, with beer-battered crab, lettuce, tomato, red onions, oregano, and oil and vinegar between a seeded baguette; and in a double dose, with a tempura-battered soft-shell atop crab-potato salad. Swing by Center City’s Misconduct Tavern at lunch or dinner for a beer and a fried soft-shell crab sandwich. The sports bar’s take on the classic features sourdough bread, paprika-spiced mayo, and sliced avocado, with a choice of salad or fries. A Japanese take on soft-shells, Zama in Rittenhouse Square presents pan-fried crabs with a citrusy yuzu-soy butter by the single or double order (dinner only). All crabs are served with sautéed shiitake, chanterelle, cremini, and shimeji mushrooms. Soon to hit Pumpkin’s dinner menu: buttermilk-soaked, semolina-battered soft-shells over pea purée. Fresh herbs, peas, and local spring lettuces drizzled with a buttermilk dressing will accompany the dish at this Graduate Hospital BYOB. Soft-shell crabcake sandwich at Tipsy Bistro, 3131 Walnut St.
Make it a sandwich or a full meal at West Philly’s Tipsy Bistro, which stuffs an Old Bay-spiced soft-shell in between brioche, along with lettuce, tomato, bacon, and an ancho-chili aioli. The large(r) plate comes with lightly battered crabs, Parmesan-seasoned potatoes, and sautéed broccoli. Next week, sautéed soft-shells (two per order) are headed to University City newcomer the Common. Chef Patrick Feury pairs them with serrano chilies, Thai basil, and local ramps. In Bryn Mawr, find soft-shells dredged with squid-ink tempura batter at Enoteca Tredici. Two to an order, the eye-catching entree is served with blanched asparagus and cipollini onion and potato puree. Collingwood’s Nunzio Ristorante Rustico pan-fries soft-shells with garlic, fresh basil and parsley, capers, cherry tomatoes, lemon, and a splash of white wine. Order one crab as an appetizer or two for dinner; both are served over angel hair pasta for lunch and dinner. Fuji, Haddonfield’s longtime Japanese standard, offers soft-shells two ways: deep-fried or sautéed as an appetizer or main course. The starter features a single crab with stir-fried shiitake mushrooms. The entree consists of two soft-shells with rice and mixed vegetables in garlic sauce.